In this tip, I share a method to increase and decrease the number of revolutions (revs) you have on the ball. As a rule of thumb, changing the number of revs is an important skill that will allow you to change the amount of skid (length) as well as strength (backend reaction) of your bowling ball. It effects both the amount of skid and the amount of push. I share a method of increasing or decreasing the amount of revolutions (revs) you have on your bowling ball. As a rule of thumb, changing the number of revs is an important skill that will allow you to change the amount of skid (length) as well as strength (backend reaction) of your bowling ball. I bet I have your attention now. First and foremost, as a bowler, you need to have an understanding of how revolutions impacts both skid and push. A skilled bowler knows that several factors will increase the amount of skid. These include both ball speed and revolutions. But, in addition to skid, revs and speed also effects what we call push. Push is the distance that the bowling ball will go past the end of the oil pattern prior to reacting and making a move toward the pocket. So, due to speed and revs, the ball pushes past the end of the pattern a certain distance. More will be further. Less will be shorter. Research conducted at the United States Bowling Congress earlier in the year has shown that increasing revolutions actually has more impact on the amount of push, distance moving past the end of the oil pattern, than ball speed does. As the number of revolutions increases, the amount of push increases along with the strength of the backend reaction. So, changing the amount of revolutions can allow you to control the amount of skid as well as the amount of push. But, beware, as you increase revolutions you will also increase the backend reaction as well as skid and push. Sometimes, the added revolutions can create a ball reaction that is too long and too late causing many splits and difficult spare conversions. Learn this system and use it wisely. To begin with, try this simple way of increasing and decreasing your revolutions. Increasing and decreasing revolutions is as easy as 5-6-7. Literally, the name corresponds with the starting position of the middle finger in the stance. To increase revolutions, you just change the starting position of the middle finger and keep the finish release position the same. 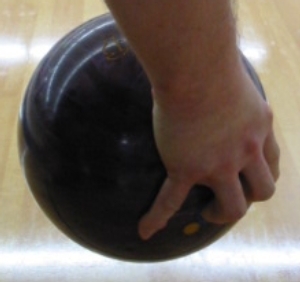 For right-handed bowlers, as your middle finger changes position, from 5 to 6 to 7, you will increase the amount of revolutions on your bowling ball. First and foremost, you need to follow-through with the same finish release position. I recommend that you use a 45 degree release primarily. 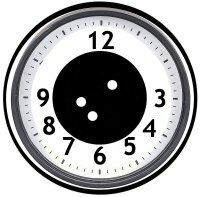 This is where your fingers are in the 4 (middle) and 5 (ring) o’clock position. I refer to this as the 1 o’clock release. 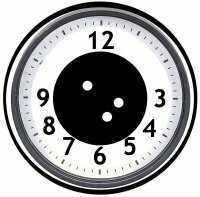 If the thumb exits the ball and is extended fully, it will point to 1 o’clock. 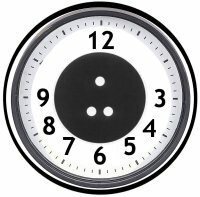 Imagine looking at a clock about 5 feet in front of you with your shoulder directly in front of 12. One o’clock would be located up and to your right. Literally, as you are releasing the ball imagine your thumb going to 1 o’clock. Now, remember, keep your release the same as you experiment with changing revolutions. You want the same finish to see the effect. For each of the three examples, keep your hand in the starting position in the pushaway. As a rev rule of thumb, always begin with your hand in the 6 o’clock position. Your hand will be directly under the ball. Be sure to keep your index and pinky tight. In other words, do not spread your fingers. This release will provide you with medium revolutions. To increase revolutions, start with your middle finger in the 7 o’clock position. Lefties, you would start in the 5 o’clock position. So, you will turn your hand and wrist so the ball is more on the outside. This position will set you up to achieve more rotation of the hand to the point of release. Thus, this position will increase the amount of revolutions. But, be sure to put your other hand under your wrist to support the weight. To decrease revolutions, start with your middle finger in the 5 o’clock position. For left-handed bowlers, you should start with the middle finger in the 7 o’clock position. Ideally, you won’t rotate your hand and wrist at all. But, like two gears, the actions of your follow-through will cause revolutions. But, it will be less than the other two starting positions. Great bowling is about being able to change to better match-up with the lane condition. It is not always about longer and stronger. Sometimes, earlier and weaker will yield the big numbers. Changing your rev rate can be achieved with this simple 5-6-7 system. But, remember as your rev rate increases, you will also increase both skid and backend reaction. As you decrease your revs, you will decrease skid as well as backend reaction. Use this knowledge wisely and experiment with using speed changes with each of these three starting positions. The more you know the better you will become.